Special Valentine Roses - Send special roses for valentine day and valentine week. Choose from our unique collection of special roses including bunch of roses, single rose, yellow roses, love roses, mixed roses, pink roses, red roses, white roses and many more. Free Shipping in India. If something in this world signifies tenderness, beauty, dazzles and love altogether then for sure it is the description of roses. No love proposal is conveyed without blooming roses. For the special celebration of love as Valentines Day the significance of roses deliberately increases. Whatever is the color of roses, whether it’s a red one for love or a yellow rose for friendship or it is simply a rose bud, a small exposition of rose for your loved one will speak away your heart. Evoke and evince the true feelings for your Valentine complimented with roses and lay a strong foundation for your love life. Impress your lady with mesmerizing bunches of red roses or present an assortment of roses to make her feel more delighted for the special day. 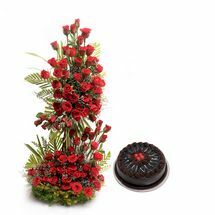 If she is far you can astound her by sending special roses online through Elitehandicrafts.com. For your Valentine there are special collections available. There is no age for love, and hence Special roses for all the special relations are available here. Whether you want to express love towards girlfriend, boyfriend, wife, husband, mother, or father Valentine Special Roses is what all you need. Bestrew romance all around with the fragrance of roses. There is an amassment of beautiful roses available in beautiful sets and presentations. For those who want to present a big fat surprise to their sweetheart there is a collection of Red Roses. Those who just want to make it a good start of their relationship they can present Pink rose bouquets. If you want a combination of all then you can surprise your love with assortment of roses. Special roses that are handpicked are exclusively available for Valentines Day at Elitehandicrafts.com. Express the love feelings this Valentines Day to your affectional through Special Roses. You can also Send Valentine Special Roses Online to your beloved and mark the day of love together.